China’s new defence white paper is more transparent than previous efforts. But it still leaves out some interesting things. China’s National Defense in 2010 continues the tradition of offering additional bits of information each year, but still refrains from delving into the concrete discussion of China’s military capabilities that foreign defence analysts hope for. To its credit, the 2010 White Paper is a carefully-written document that offers insight into China’s defence policy and some general trends in its military development. Beijing’s ongoing moves toward defence transparency are positive even if they fall short of foreign expectations. We recognize that China’s Defense White Papers to date have shied away from discussing specific systems and capabilities, but believe that even discussions that might not be as fact-rich as documents published by the United States or other foreign militaries would still help China build strategic trust with other regional powers. In addition, a rapidly modernizing military like China’s that performs an increasing range of activities in its home region has much to gain from greater transparency about capabilities and intentions, as such disclosure could help reduce its neighbours’ incentives to create new negatively-focused security arrangements aimed at counteracting the rising power. With regard to higher transparency regarding equipment and capabilities among militaries outside of China, the United States military’s Quadrennial Defense Review and Nuclear Posture Review are excellent examples of documents that combine discussion of strategic intentions with more detailed and concrete discourse on hardware and acquisition plans. In addition, other militaries tend to publish a regular flow of official policy statement and documents discussing procurement and other activities. The biannual China Defense White Paper, on the other hand, has covered insufficiently or overlooked entirely key developments in a rapidly changing country where two years of change can be far more momentous than would be the case in the United States, Japan, or the EU. A number of specific military developments cause significant concern to China’s Asian neighbours, as well as the United States. If the Chinese leadership were to permit a more detailed discussion of these types of matters in future White Papers, it would likely help assuage foreign concerns about China’s military modernization in Asia and beyond. To help quantify the importance of the systems and developments that are not discussed, but in our opinion should be, we assign them an importance ranking of between 1.0 and 10.0, with a higher number suggesting that an issue is of more pressing concern to foreign analysts of China’s military development. The report contains no mention of China’s ASBM programme, which, according to the US Navy, reached the equivalent of initial operational capability (IOC) in late 2010. The timing of this particular announcement might be a bit late for inclusion in the report, especially with Beijing’s official silence on the matter, but for the programme to reach the equivalent of IOC in late 2010, it had been in development for a number of years prior. From the perspective of the United States and regional militaries, an operational Chinese ASBM system with a range that is likely at least 1,500 kilometres is a major event, since it may prompt a re-think of carrier operations within a threat envelope that now potentially extends far into the South China Sea, Northern Indian Ocean, and Western Pacific. In turn, any restrictions on carrier operations would have two key effects: (1) they could cause US allies in the region to question Washington’s true security commitment during a confrontation with China, since the United States might be perceived as confronting a choice as to whether to expose carriers to serious risk of damage, for example; and (2), the ASBM reinforces the importance of submarines for regional navies, since large capital surface ships may not be nearly as survivable as before, particularly for countries other than the United States and Japan that lack advanced ship-based anti-ballistic missile systems. In 2010, China’s number of space launches equalled the US launch figure for the first time. More importantly, a significant portion of China’s launches involved satellites that are helping to build up a persistent and survivable ISR capability along China’s maritime periphery and beyond. China has launched 7 Yaogan surveillance satellites since December 2009, suggesting that a more robust spaced-based reconnaissance capability is a high priority for China. Yaogan satellites 9 A, B, C are particularly interesting because they fly in a formation, which suggests that they function as some form of naval ocean surveillance system (NOSS). Jane’s says these satellites carry infrared sensors to help them locate ships, meaning they could probably provide accurately positional locations for ASBM targeting. China is also reportedly preparing to launch a second Tianlian data link satellite in June 2011, which in conjunction with the existing Tianlian-1, could provide coverage over as much as 75 percent of the earth’s surface. Improved data linking capabilities would help strengthen China’s ASBM “kill chain” by further linking sensors with shooters. In January 2010, China successfully tested a midcourse intercept anti-ballistic missile (ABM) system likely based on the same SC-19 booster system that powered the direct ascent anti-satellite (ASAT) system the PLA used to destroy an aging weather satellite in January 2007. China’s multiple successful tests indicate that the PLA is becoming proficient at using hit to kill kinetic intercept vehicles that could be launched from Chinese soil and hold valuable U.S. reconnaissance and other military satellites at risk during a conflict. China’s first test of a 4+ generation fighter comes 20 years behind that of the United States (the F-22 Raptor first flew in 1990), but could become an aircraft that makes Washington rue its decision to cap F-22 Raptor production at 187 aircraft. Analysis from Airpower Australia’s Dr. Carlo Kopp strongly suggests that a J-20 with 5th generation characteristics could outperform the F-35 Lightning II at virtually all levels, potentially leaving the United States and allies operating the F-35 at a disadvantage to a PLA Air Force armed with super cruising, stealthy, and manoeuvrable J-20s. Of course, there are a wide variety of other ways to target and mitigate attacks from opposing aircraft. 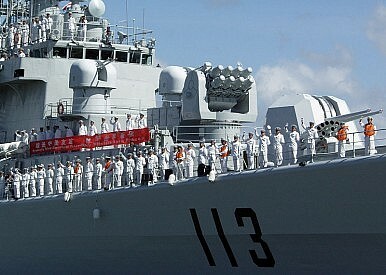 The 2010 China Defense White Paper also contained no mention of China’s aircraft carrier programme. The New York Times has reported that one of the paper’s presenters, Sr. Col. Geng Yansheng, sidestepped questions about the carrier programme during the March 31 news conference at which the paper was unveiled. China appears to be rapidly refurbishing the ex-Soviet carrier Varyag; the US Office of Naval Intelligence (ONI) projects that it will be operational by 2012. According to the Asahi Shimbun, China has decided to embark on a national carrier programme in which it would build domestically a 50,000-60,000 tonne conventional carrier by 2014 (ONI projects that it will be completed after 2015) and a nuclear-powered carrier by 2020. China certainly faces substantial challenges in equipping a carrier, training pilots in carrier operations, and building a carrier group. That said, the country’s rising defence budget (officially $91.5 billion in 2011) and the experience of domestic shipyards in building increasingly complex large commercial ships make it likely that physical construction barriers can be overcome in a reasonable amount of time. Mastering the intricacies of carrier operations will take longer and a Chinese carrier group would likely not survive very long in a direct confrontation with the US Navy. Still, a carrier group would offer immense diplomatic benefits in providing a visible Chinese naval presence in the South China Sea, Southeast Asia, along key sea lanes in the Indian Ocean, and for humanitarian missions such as the response to the 2004 Indian Ocean tsunami. Several carrier groups would be necessary for persistent presence in these areas, however, to allow for periodic maintenance. The February/March 2011 Libya evacuation operation involved a forward-deployed PLAN missile frigate, Xuzhou, which had recently replenished in Oman, as well as the use of the Khartoum, Sudan airport to refuel IL-76 transports headed to and from Libya to evacuate Chinese nationals trapped there. For any future military deployments for non-combatant evacuation operations (NEOs) or other such expeditionary military activities, port and airfield access in the region concerned is crucial for supporting and sustaining platforms involved in the mission. Areas for potential deepening of PLA logistical support and access during times of crisis that merit close watch in coming years include: Tanzania, Kenya, Madagascar, Djibouti, Salalah (Oman), Aden (Yemen), Gwadar and Karachi (Pakistan), Chittagong (Bangladesh), Hambantota (Sri Lanka), Mauritius (where Port Louis has sufficient draft to accommodate a large warship), Sittwe (Burma), and Singapore. The 2010 Defense White Paper makes no mention of the deployment of PLAN and PLAAF forces to help secure the evacuation of Chinese citizens from Libya, an historical first. It will be interesting to see how Beijing evaluates and portrays such efforts in the future. They are positive and understandable, but may raise expectations among Chinese about what their government can do to address subsequent threats to the security of Chinese citizens overseas. China’s 2008 Defense White Paper didn’t include discussion of the PLA Navy’s precedent-setting Gulf of Aden counter-piracy mission, which began at the very end of 2008, but the deployment made it into the 2010 White Paper. We strongly suspect the 2012 Defense White Paper will include meaningful discussion of the Libya evacuation operation and the PLAN and PLAAF roles in the historic mission. Andrew Erickson is an associate professor at the US Naval War College and fellow in the Princeton-Harvard China and the World Programme. Gabe Collins is a commodity and security specialist focused on China and Russia. This is an edited and abridged version of the commentary on the white paper. The full version can be read here.